Barcelona is part of a region in Spain called Catalonia. Many Catalonians consider themselves apart from Spain and want independence from the Spanish government. In fact, the issue has been around since before Franco took power in 1939, going all the back to Franco-Spanish War 1635. But what’s been happening lately? Well, many of the Catalonians are still wanting independence, and the politics are heating up. Recently there have been demonstrations, mostly in the city of Barcelona, with tensions rising, causing these demonstration to be almost riots, but not quite. From what we understand, the President of Catalonia has signed a declaration of independence, but has asked the Catalan Parliament to not vote on it, just yet. Apparently there are still negotiations in play behind the scenes that we, the foreign tourists, don’t have the sophistication politically to understand. Certainly there are issues on all sides that would take a far better understanding of Spanish political life in general, and Catalonian life in particular, for us to fully embrace. For that reason, we’ve decided that an opinion by us on the subject is pretty much worthless, so we won’t render one. For now, we’re staying close to our hotel. 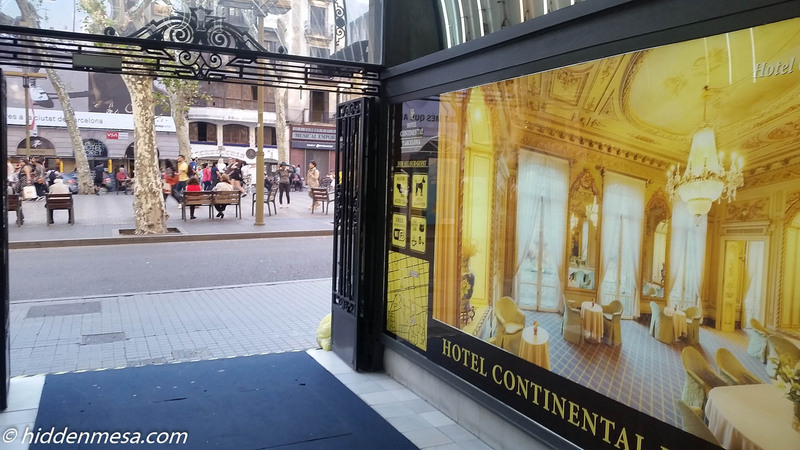 We’re in our favorite haunt, the Hotel Continental, on La Rambla, near the famous Caltalan Square in downtown Barcelona. We’ve been here before and even posted about it here. The hotel is still eclectic. 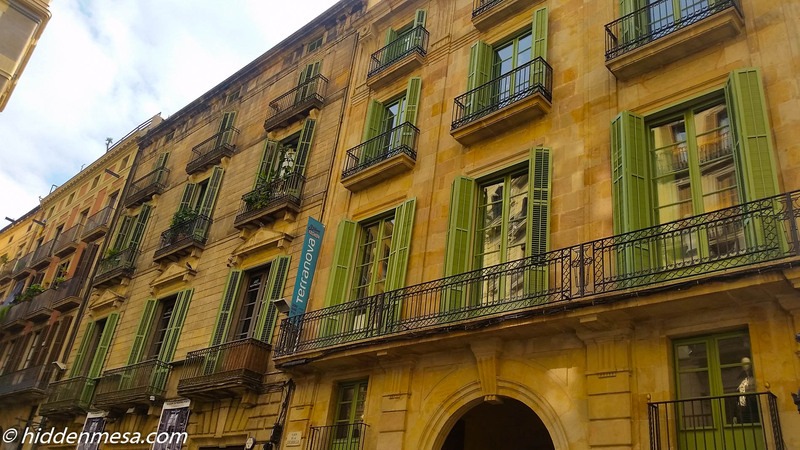 It comprises 40 rooms, 11 of which are balconies overlooking La Rambla. So far, we’ve only been able to book interior rooms. Never a balcony. So instead of the busy street life outside our window, we get the peace and quiet of an interior court. We’ve ventured just around the immediate area, strolling La Rambla from the Square down a few blocks toward the ship terminals. By the way, you may see La Rambla referred to as Las Rambles because it is actually made up of several different named streets. we went with “La Rambla” because that’s what it says on the street signs. Nothing like being there to verify. 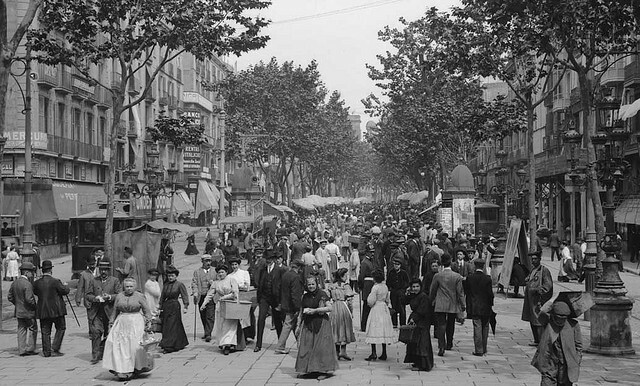 La Rambla is a famous street in the Heart of Barcelona. It’s where all the tourists go first, and then spread out to see the rest of the city. There’s an underground train running down the length of La Rambla, so it’s easy to think that the street was made as it is in recent years because of the construction of the subway. In fact, the street used to be a combination seasonal stream and full time sewer in the 14th century. In 1377, construction of new city walls began, and in 1440, the stream was diverted around the new walls. 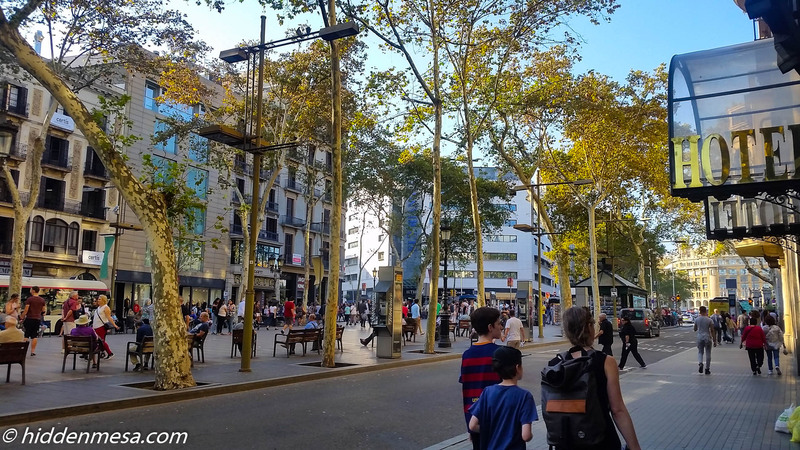 From then on, Las Rambles has been evolving as a popular street. This is how La Rambla looks today. From a distance, not much has changed. Photo by Donald Fink. The town actually looks quiet to us, for a busy European city. We see folks from all walks of life. Certainly the Spanish are about, but the streets are full of tourists from all over too. Remember that this is a major Mediterranean port. Folks come here to catch cruise ships as well as ferries to and from nearby cities in Northern Africa. As the weekend approaches, we see more folks from outside the area, possibly from Morocco, Algeria, and Tunisia. It reminds us of shopping areas in San Diego, when the weekend approaches and folks come up from nearby Mexican cities to shop. It appears to be the same thing here in Barcelona. At least, that’s our view of what’s happening. Barcelona is notorious for pickpocketing, but so is nearly every city along the Mediterranean. At least, that’s what we’ve read. We haven’t personally witnessed a single incident of any kind in this town. Of course, that might be in part because we’re in a big city, and as a result, we take precautions. Precautions in this case mostly amounts to not going places we shouldn’t go, not looking like victims, and paying attention to our surroundings. La Rambla didn’t get our full attention on this trip, but we’ll certainly be back. 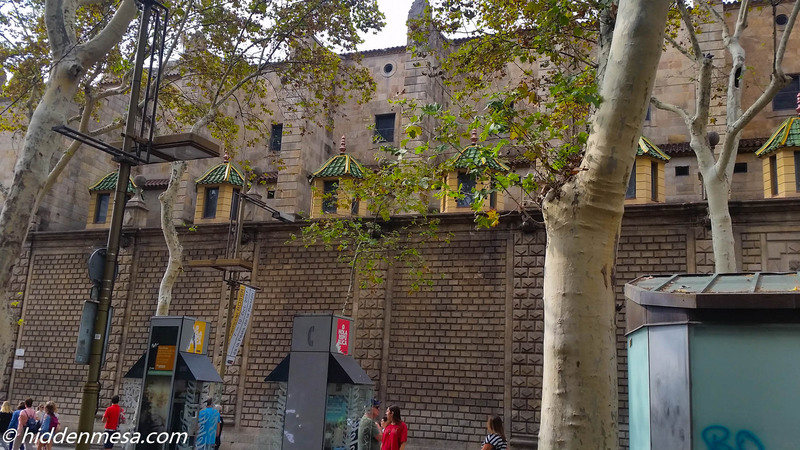 Barcelona is quickly turning into a favorite town for us, partly because it’s where we tend to catch a ship for a cruise, but also in part because it’s just a fun town to visit. The weather is good and the streets are lively but still reasonably safe. What’s not to like? 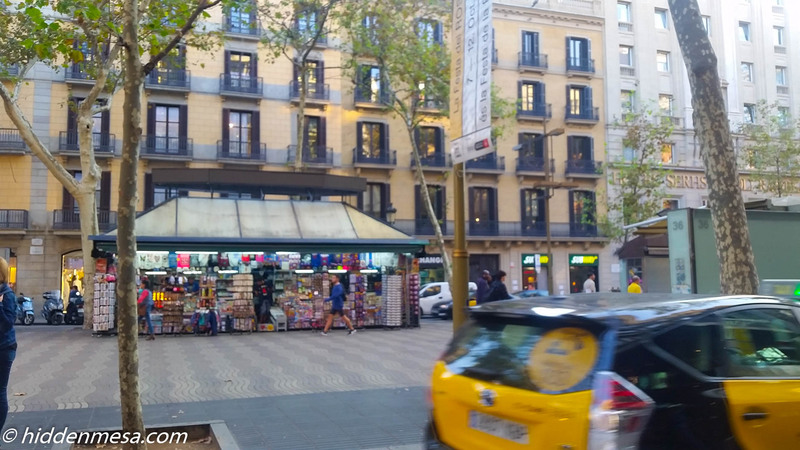 A street view of La Rambla from outside the Hotel Continental. This is about a block from the end of the avenue near Catalan Square. Photo by Bonnie Fink. 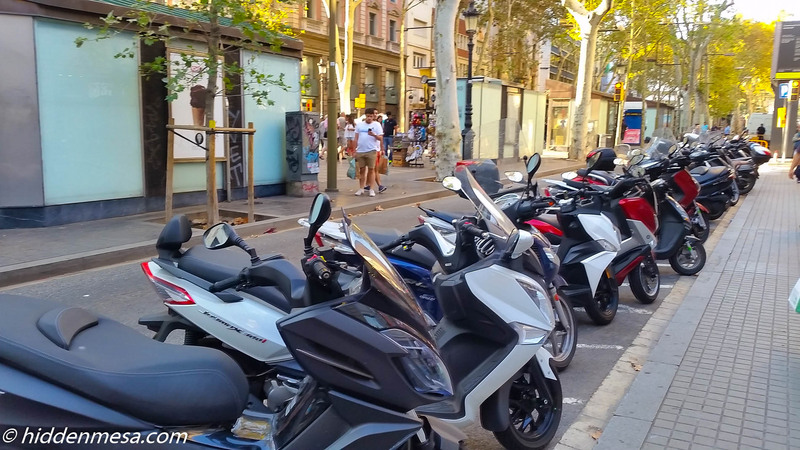 Parking is extremely limited on the streets in Barcelona, especially on La Rambla. Here, if you're not riding a scooter, you're out of luck. Photo by Bonnie Fink. 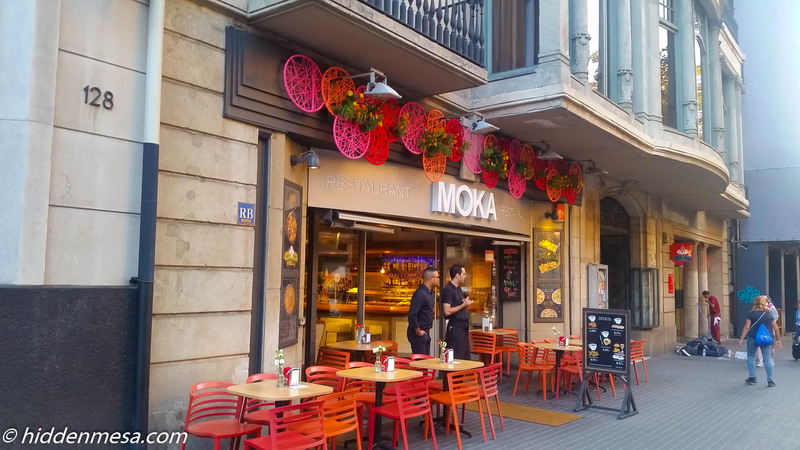 Here's one of the many restaurants along La Rambla. It's near Hotel Continental and seems to attract lots of American customers. English is not a language that's normally spoken at this restaurant, but the menus have pictures. Photo by Bonnie Fink. 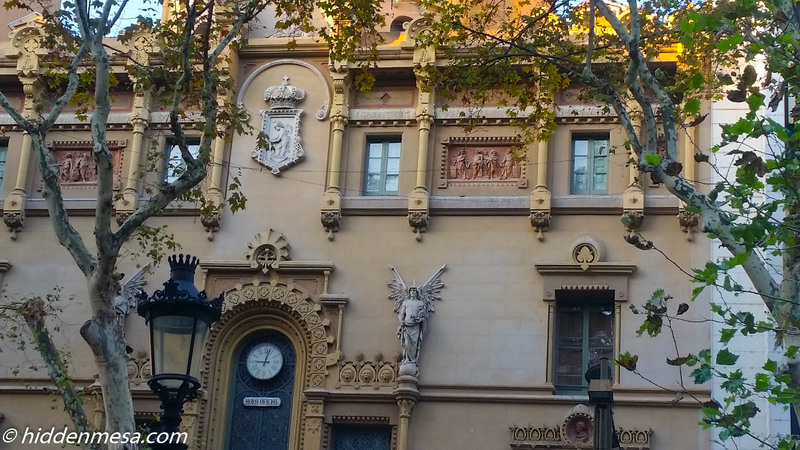 Ornate decorations on the buildings along La Rambla, and indeed much of Barcelona, is common. It would take a competent tourguide to explain all that it here. Photo by Bonnie Fink. The center section of the walkway on La Rambla is home to various temporary vendors, usually selling tourist items like maps, coffee cups, and so on. Photo by Bonnie Fink. 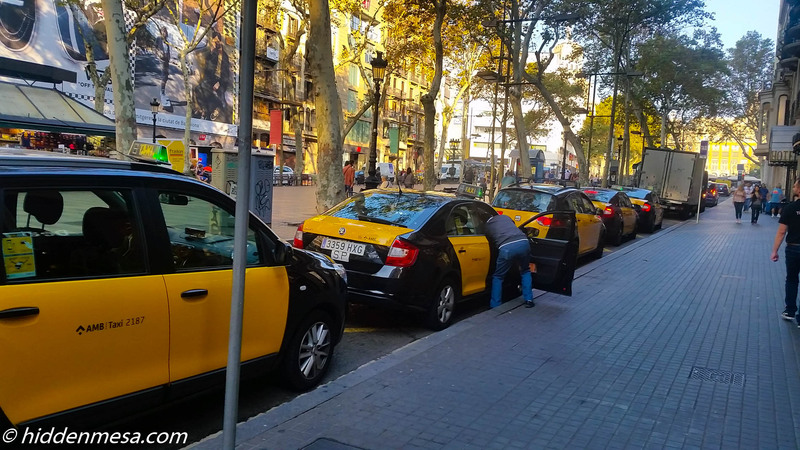 Taxis wait for fares along La Rambla in downtown Barcelona. Photo by Bonnie Fink. 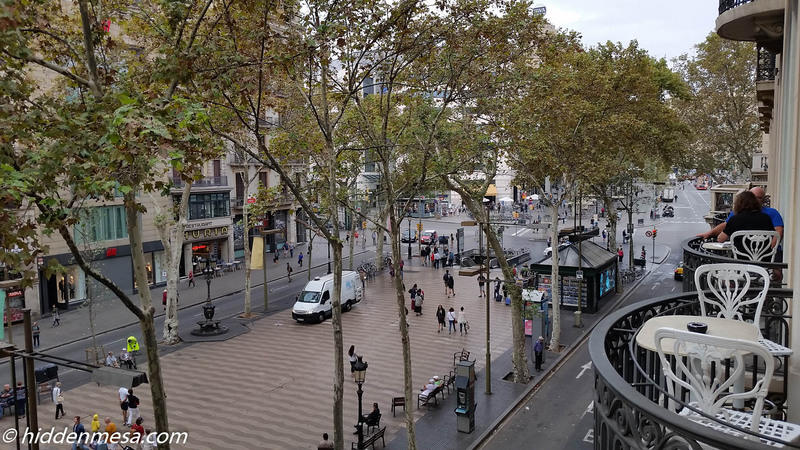 From above, you can see the layout of La Rambla. The center area is for pedestrian traffic while a single auto lane on either allows traffic down the street. 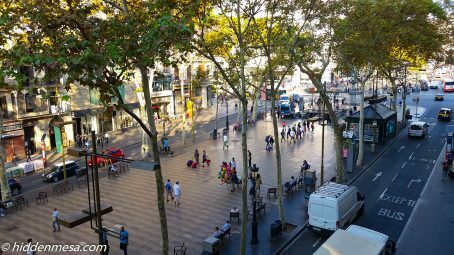 No cross traffic is allowed on La Rambla anywhere, keeping the area predominently for pedestrians. Photo by Bonnie Fink. 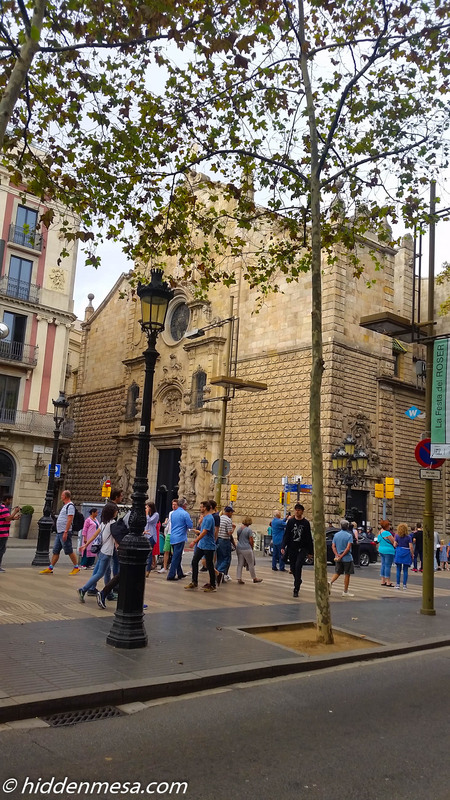 There are several churches along La Rambla. They seem to blend into the scenery, but they're stunning when you take a closer look. This church, the Church of Bethlehem, was constructed beginning in 1681. Photo by Bonnie Fink. There's so much competition for your attention on La Rambla, something as old as the Church of Bethlehem just blends in. Photo by Bonnie Fink. 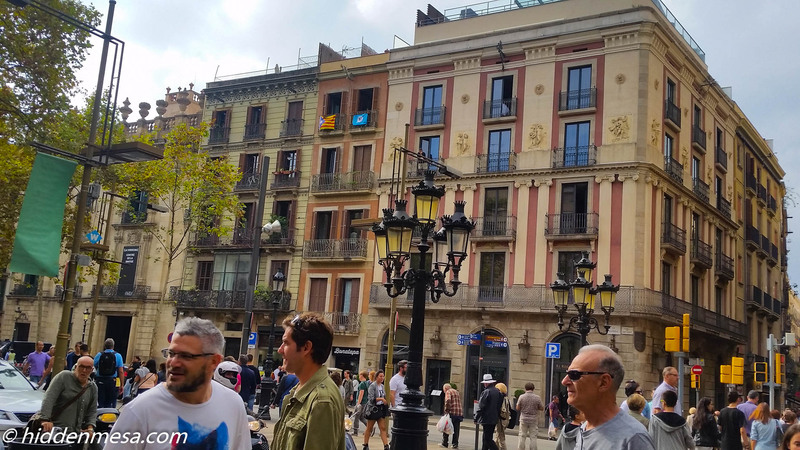 Apartments and hotel rooms are located above the businesses on La Rambla. In many cases, it's not clear which is which. Photo by Bonnie Fink. 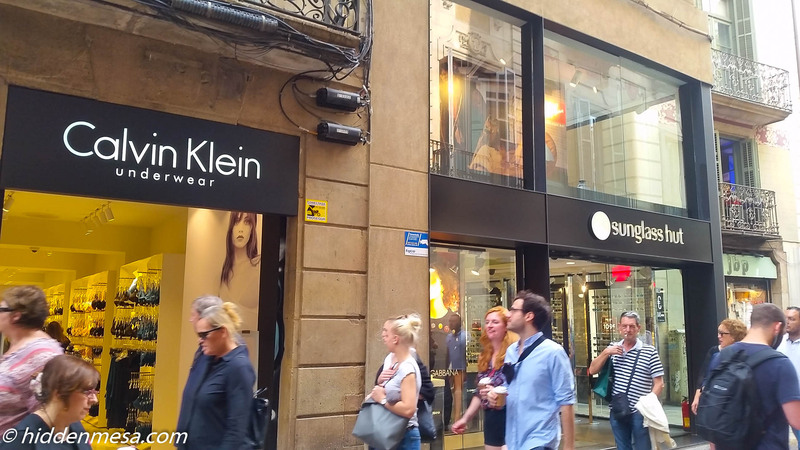 Big brands are not hard to spot when shopping in Barcelona. Photo by Bonnie Fink. 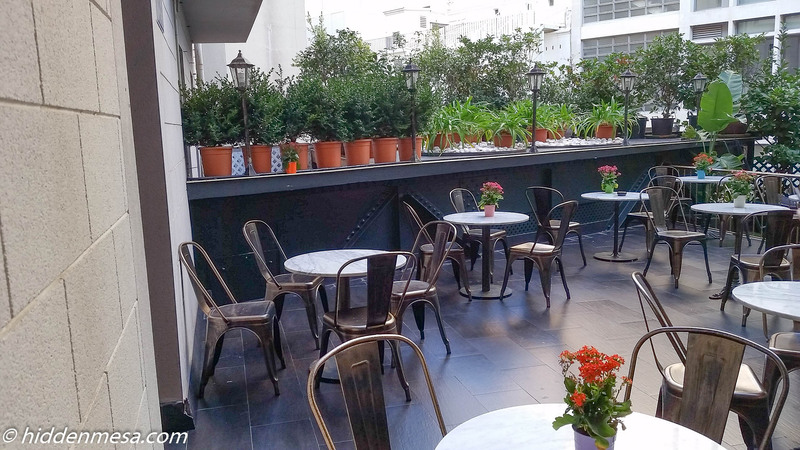 Therea are eleven rooms at the Hotel Continental that have balconies overlooking La Rambla. We're been trying to get one reserved for two years, but the closest we've come is this view from the inside eating area. Photo by Donald Fink. On many of the buildings in Barcelona, you can see flags like the ones in the upper-center of this image. The colorful yellow and red flag on the left is the official flag of Catalonia, and the one on the right simply proclaims, "Si," indicating a yes vote for Catalonian independence. Photo by Bonnie Fink. 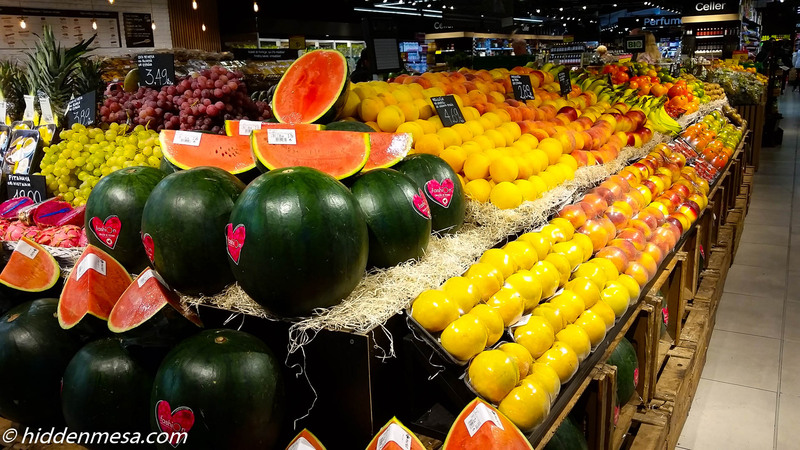 There's no shortage of fruits and vegetables in the markets here in Barcelona. It looks to be a wide variety of items too. Photo by Donald Fink. 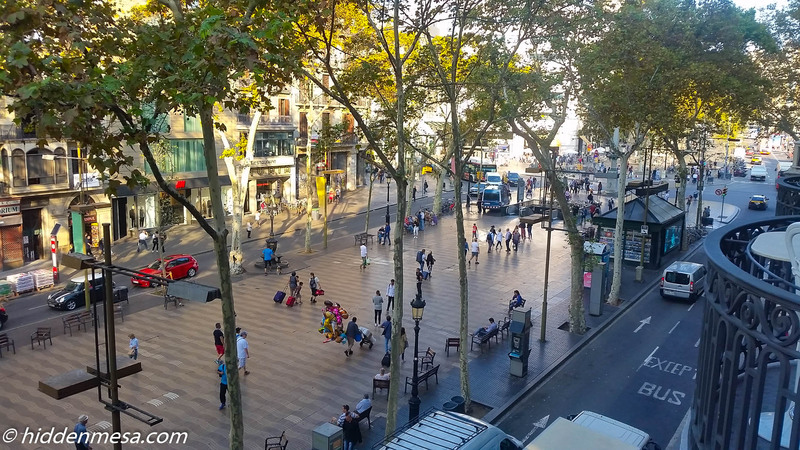 This is a street view of La Rambla from the main floor of the Hotel Continental. 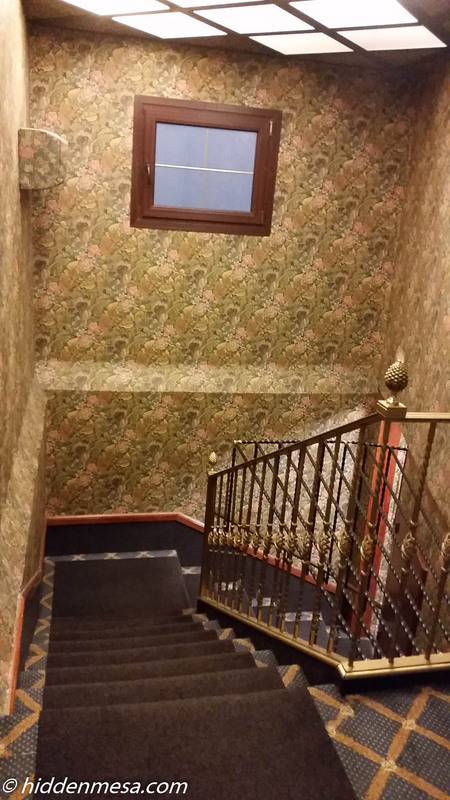 Of course, the first floor of the hotel is actually the second floor of the building. Photo by Donald Fink. From inside the vestibule looking out on La Rambla from the Hotel Continental. Photo by Bonnie Fink. 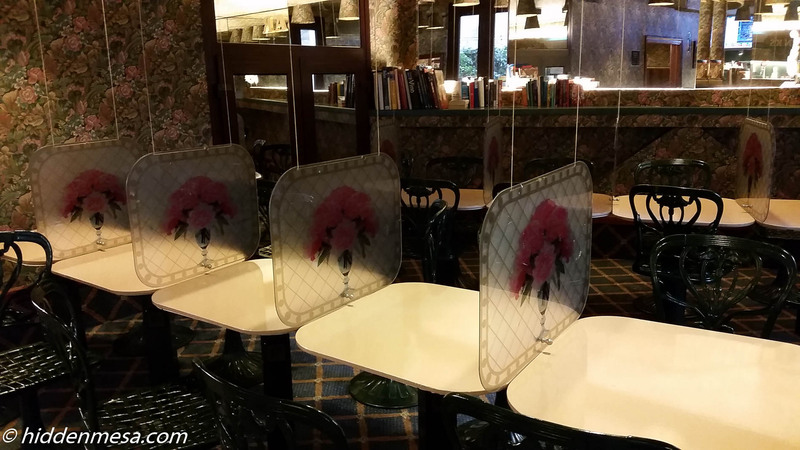 The wallpaper pattern of flowers is everywhere in the Hotel Continental. When we first stayed here, we though it was just bad taste. Now we're realizing that it a signature look, done on purpose. Photo by Donald Fink. 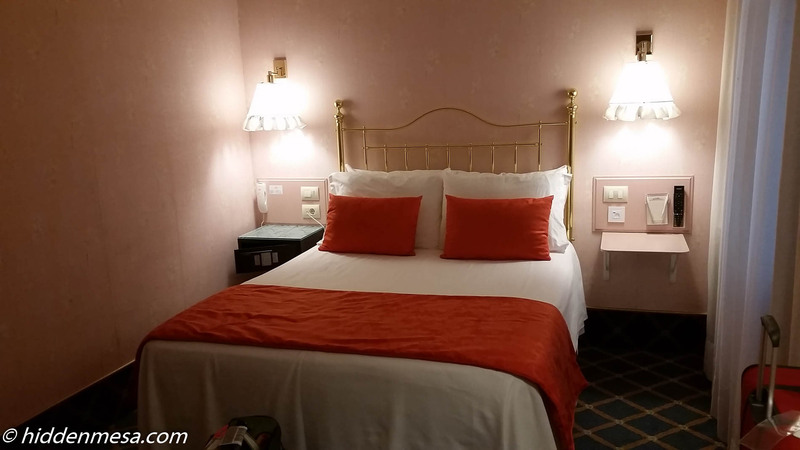 The rooms are pink, and happily devoid of wallpaper. But pink. We took a peek inside some of the other rooms where housekeeping had the doors open. They were pink too. Photo by Donald Fink. 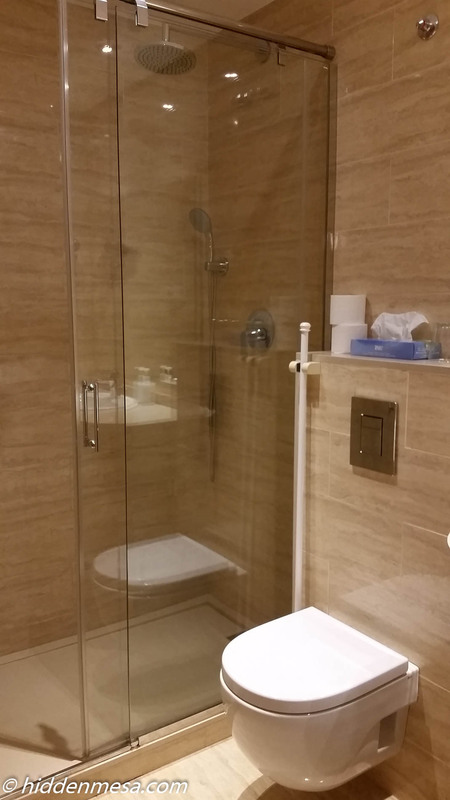 The bathroom was recently remodelled. This is a welcome sight from our last visit. Photo by Donald Fink. The room has a control panel near the entrance door that seems to control pretty much the whole room. In case you don't speak Spanish or Catalan, each control has a picture for yur convenience. Photo by Donald Fink. Did we mention pictures? 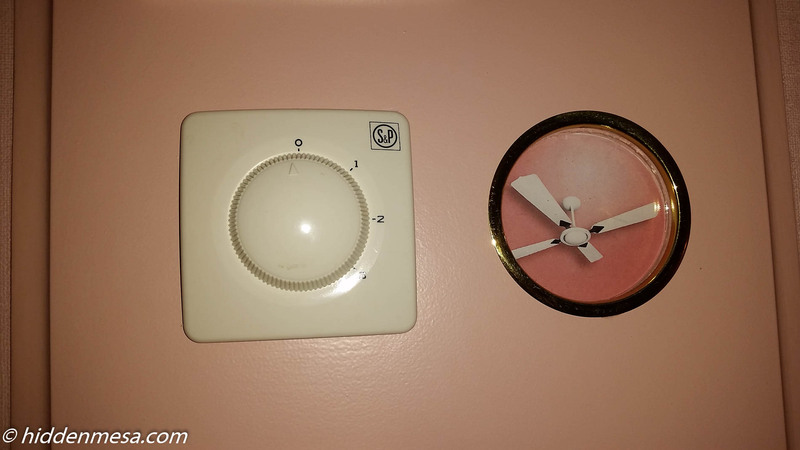 This is the fan controller for our room at the Hotel Continental. Photo by Donald Fink. Food and drink is available all day, every day at the Hotel Continental. HEre, you have a choice of orance juice or wine. Photo by Bonnie Fink. There's a computer for guests to use in the reception area. 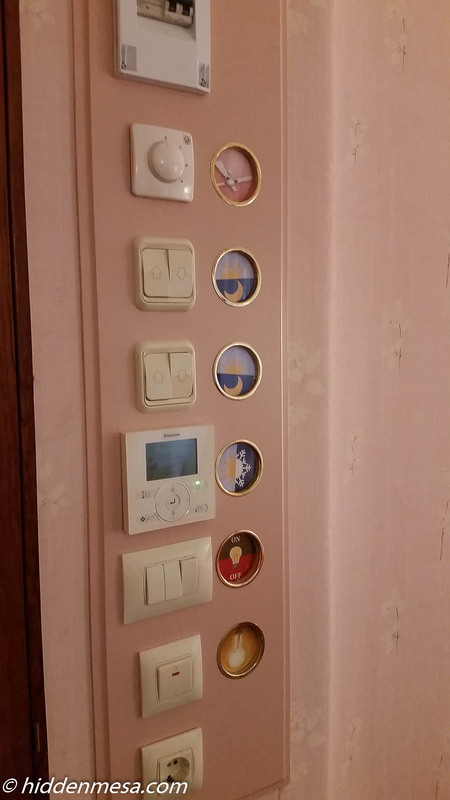 In case you have your own devices, you can use these handy work areas. Each desk has a power plug too. WiFi is quite strong and works well in this hotel. Photo by Donald Fink. 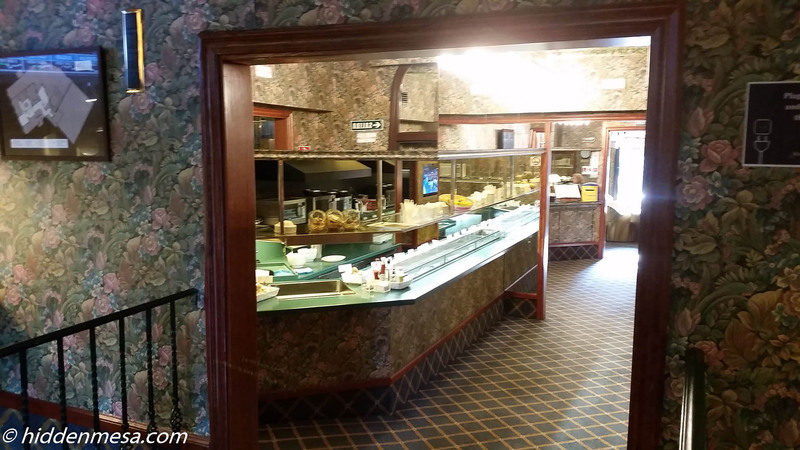 There's a variety of foods from sandwich meats to pastries available all day and night at the Hotel Continental. 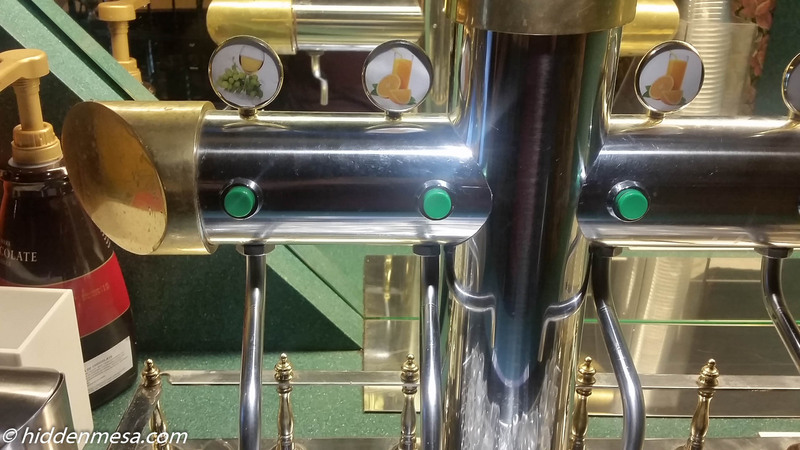 There's also a variety of coffees, beer, and soft drinks. It's actually quite handy. Photo by Donald Fink. Everything from coffee, to beer, wine, ice cream (yogurt), soft drinks (not shown), and something that's not common in Europe. 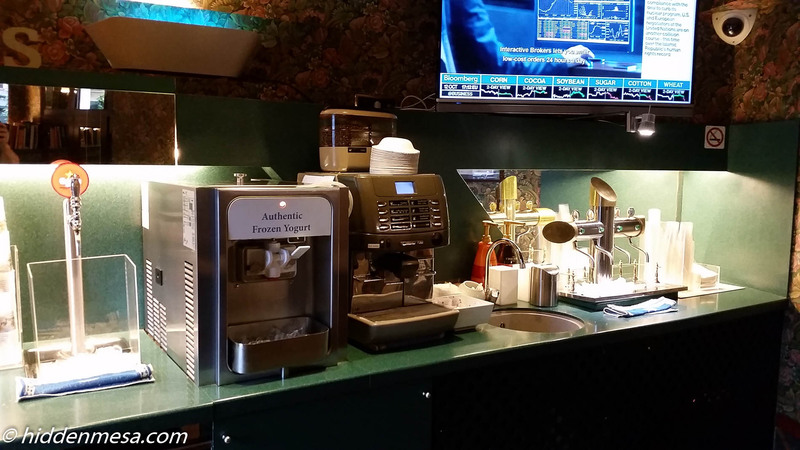 Ice for your drinks. Photo by Donald Fink. There's a seating area in the back of the hotel that's quiet and secluded. It's also a great area to enjoy a snack or drink in quiet. Photo by Donald Fink.